A luxury bijou cottage set in the heart of the historic Suffolk market town of Hadleigh. 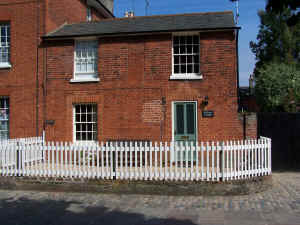 St. Mary’s Cottage is a Grade II listed building that dates back to the mid 1800’s, when it was originally built as the annexe to a large Victorian town house. The cottage is set adjacent to Hadleigh’s historic fifteenth-century church, St Mary’s, which was painted by Suffolk’s two most famous artists, John Constable and Thomas Gainsborough. Completely refurbished for the 2004 season the cottage has the feel of a historic building but with all the convenience of modern amenities. The décor and furnishings have been fashioned in the style of one of the exclusive new boutique hotels such as the Hotel du Vin chain or Babington House. St Mary’s Cottage provides comfortable and stylish accommodation for two people. The ground floor is open plan with a modern, well-equipped kitchen and dining/living area. The first floor also has an airy, spacious feel with an en-suite complete with a serious shower. All your home-from-home luxuries are provided: Egyptian bed linen and towels, TV, DVD, CD player and dishwasher. A selection of CD’s, DVD’s, magazines and local reference books are provided for the use of guests throughout their stay. In addition we provide those little extra touches that make St Mary’s Cottage a unique experience. We provide a complimentary welcome hamper which includes fresh bread, milk, fair-trade coffee and tea, sugar and breakfast ingredients of your choice (English or continental). We will also arrange for delivery of a daily newspaper of your choice. When you confirm your booking we will send you details of local events and restaurants and we will be happy to arrange bookings on your behalf. With central heating included in the price, why not enjoy a week-end break or a week away out of season, safe in the knowledge that whatever the weather you will be cosy and warm. 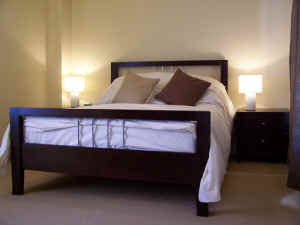 In special circumstances an extra bed and bedding can be provided for a 3rd person for an additional charge of £25.